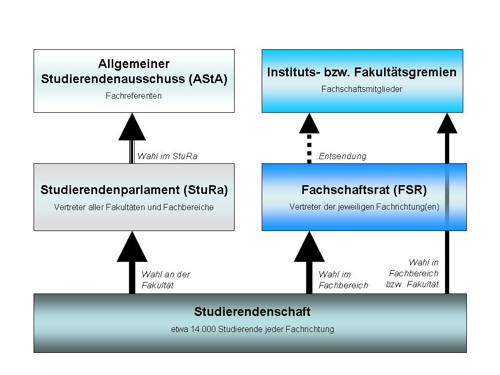 Students at the University of Rostock are represented by the Student Council (StuRa) and the General Assembly of the Students (AStA), two permanent advocacy groups for student interests. The StuRa is staffed by elected representatives from all faculties and convenes approximately once per month. Interest students can stand for election to the StuRa once per year, usually during the summer semester. The AStA, by contrast comprises students from various disciplines, each of whom has a specific scope of activities in relation to which they act as a contact point for all students. The editing team of the Student Magazine heuler is, among others, part of the AStA. An overview on the student representations is provided here.